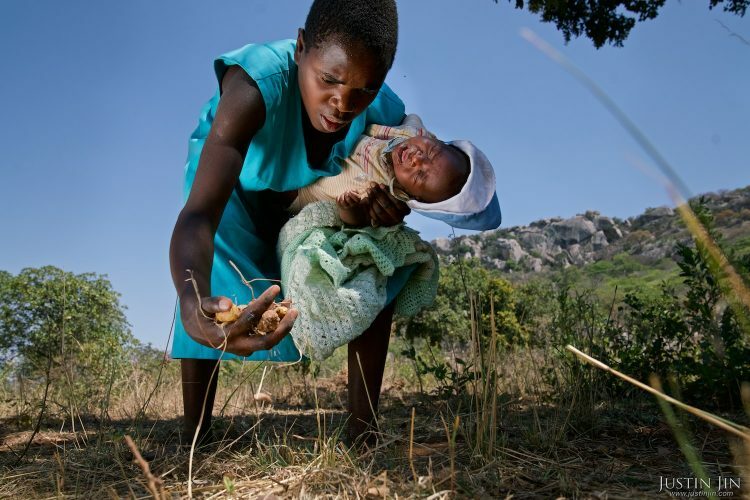 Liliosa, 16, forages for wild fruits in Masvingo Province, Zimbabwe, to feed herself, her baby and her young sister, who is born HIV positive. Masvingo Province, Zimbabwe, October 2016 – Outside the classrooms of Mutenda Primary School in remote southern Zimbabwe, giant cactus plants stretch toward the scorching sun. Inside the classrooms, children wilt in their chairs, their eyes rolling back in their heads. Southern Africa has suffered its worst drought since 1992 as a supercharged El Nino weather phenomenon blazed through seven countries, and an estimated four million Zimbabweans are in urgent need of water and food aid. Across Masvingo province, more than 75 percent of the maize crop, the region’s staple, is destroyed, making it the hardest-hit in the impoverished African nation. As rivers and reservoirs dry up, about 45 000 cattle are at risk of dying; farmers can neither feed them, nor make money selling them. Instead, some farmers are selling near starvation cows for US $10 – 30 a head to feed crocodiles, a fraction of the $300 – 500 the livestock usually go for. 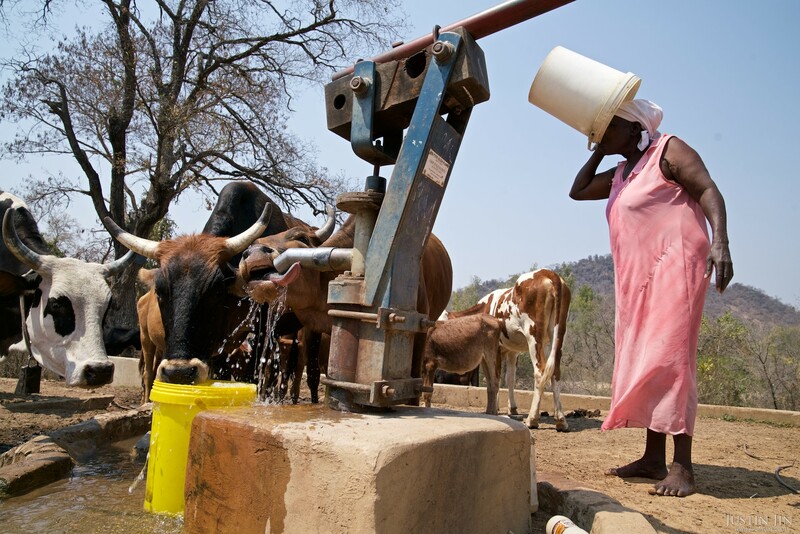 A woman and her cattle drink by a borehole in drought-hit Masking Province, Zimbabwe. Some 750 kids arrive at the Mutenda school each day on empty stomachs, ghostly after walking up to 10 km from home. Many of the younger kids turn up motivated by the government’s food program, which hands out cornmeal to kids four to eight years old, says Midzi. Students older than eight are left unfed until they reach home in the evening for their ration of cornmeal. Most of their parents cannot afford the USD1 / month fee for school food. Many even survive on wild fruits. Whenever the drought ends, the resulting problems are likely to linger for a long time, says the British aid group Oxfam, which is actively supporting the region. The lack of rain prevented this year’s planting so farmers are expecting a weak harvest next year too. As communities turn to self-defeating ways to cope — such as using up farming resources to buy food, pulling kids from school, or family abuse — effects can hurt the communities for years after. Liliosa, 16, is raising an eight-month-old baby by herself after the baby’s father ran away. She lives with her half-sister Letwin, 13, who was born HIV positive and struggles with her symptoms. After the girls’ mother and fathers died, their relatives disowned them so the teenagers take care of each other and the baby. Liliosa had been keeping the three of them alive in a barren mud hut though a combination of odd jobs and handouts from neighbours. But since the drought, there is neither work nor food to go around. Liliosa walks some 10 km a day, baby on her back, to carry 20-litre buckets of water. She survives on wild fruits and the little cornmeal she can scrape together. Just outside her hut, used condom wrappers lay strewn around empty bottles of antiretroviral medication. 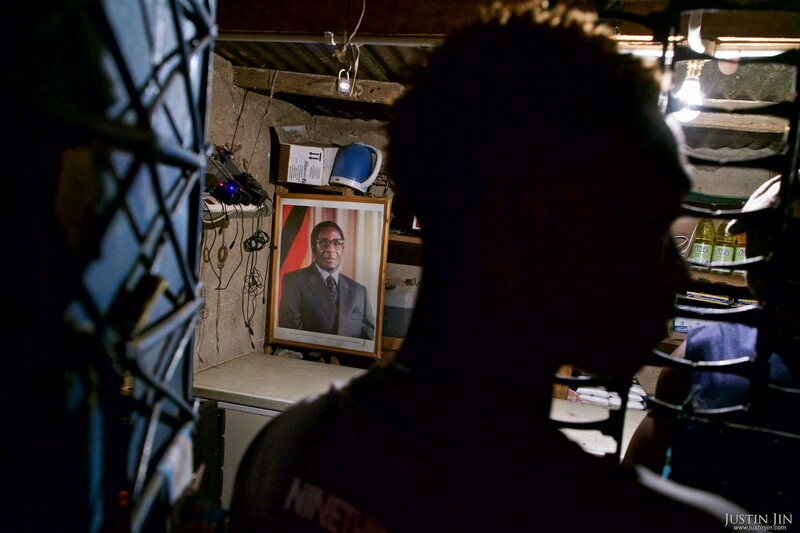 A portrait of Zimbabwean President Robert Mugabe hangs in a shop near Harare. 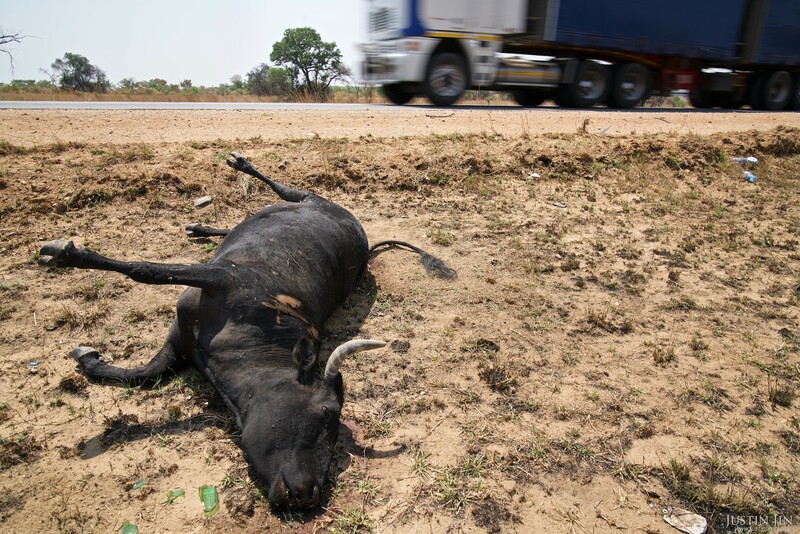 A cattle lays dead on the side of the highway in Masvingo Province, Zimbabwe, after probably being hit by a car. Zimbabwe’s food and water crisis reveals a fundamental collapse in the system. While the drought is affecting countries across the region – from South Africa and Botswana to Malawi and Mozambique – Zimbabwe is unique in declaring a state of emergency, yet failing to allocate nearly enough resources to deal with it. While President Robert Mugabe blames the international sanctions for Zimbabwe’s ills, critics point to the administration’s rampant corruption and gross mismanagement. The rapid seizure of white-owned commercial farms, combined with the lack of experienced people to put in place of them, resulted in a nosedive in agricultural output. This, together with a failure to invest in infrastructure, have left one of Africa’s most promising agrarian economies a struggling food importer. In a display that particularly galled critics, Mugabe celebrated his 92nd birthday in the heart of the drought-stricken area in February with an $800,000 party, as he was declaring a state of disaster and the administration’s lack of funds. The sum could have paid for 320 boreholes to unearth desperately needed water, almost half the 750 boreholes that the province’s administration says is needed to adequately supply the region. 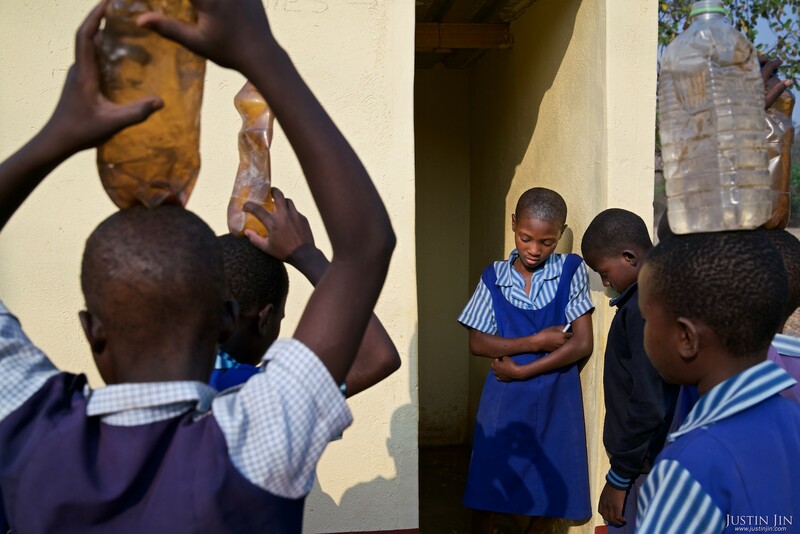 Children at the Mutenda Primary School in drought-hit Masvingo Province, Zimbabwe, wait for their turn to use the toilet. 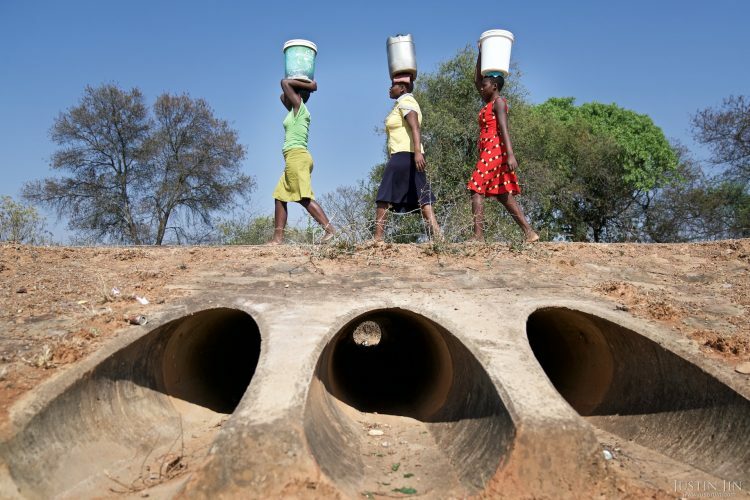 Three Zimbabwean women carry 20-litre buckets of water walk four kilometres to their homes from the nearest borehole, the area's only remaining source of water. They have to walk back and forth a total of 12 km a day to fetch water. 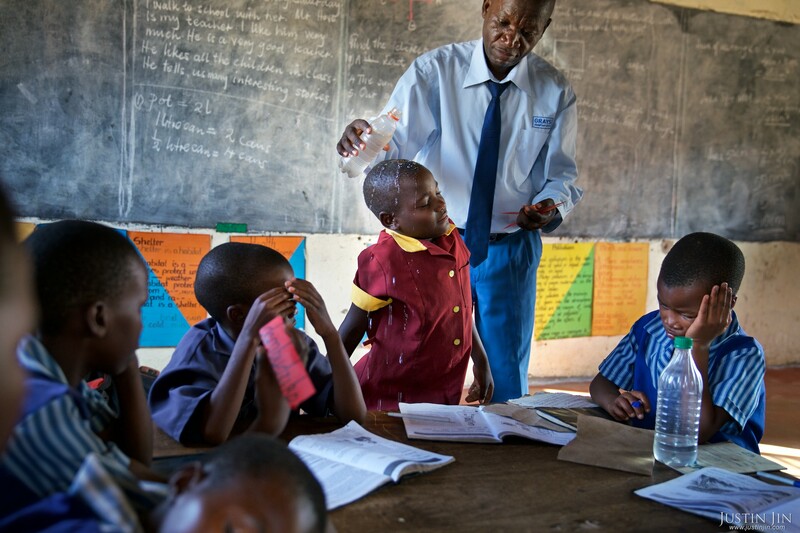 The Mutenda school’s borehole broke down 10 years ago and was never fixed, says Midzi. The school’s students now walk one kilometer each way to fetch water for laundry, sanitation and drinking. Everyone has known such an inconvenience would become a disaster when drought hits, yet nothing has been done. A single borehole costs $2,500 to drill and can serve thousands of villagers in an emergency, according to Makepeace Muzenda, the government’s local District Administrator. Most of the 350 boreholes in the province are non-functioning, so villagers instead dig holes in the dry river beds. The water that trickles out is often polluted and filled with bacteria that can lead to water-borne diseases villagers can’t afford to treat. As the drought rages on, communities are falling into deeper crises. Where the government has failed to provide, some NGOs, including Oxfam, are working directly with villagers to give them cash to buy what they most need, whether it be seeds, fertilisers, agricultural machinery, or even a school lunch. Targeted cash transfers like this have their critics. Chief Shumba, a village leader, says money given to local men will go straight to liquor and suggested NGOs give food aid instead. But proponents believe cash transfers help communities sustain functioning market systems. Midzi, the school director, agrees. A little cash goes a long way for parents struggling to feed their kids, keep their cattle alive, and work on the next harvest, she says. As for her school, Midzi has one wish. The question remains whether in Zimbabwe, this is too much to ask. Grade three (age 8-9) children at the Mutenda Primary School in drought-hit Masvingo Province, Zimbabwe, collapse from hunger and exhaustion during class.